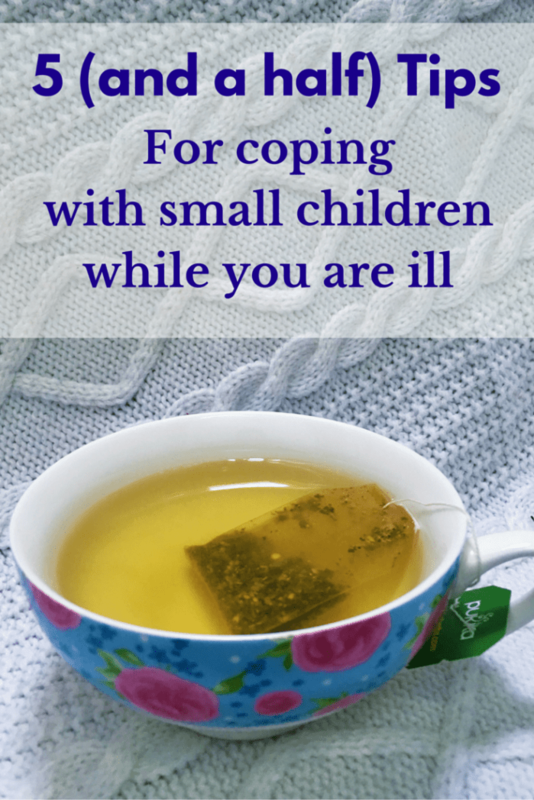 One of the hardest parts of looking after children is coping alone while you are unwell. Throw a couple of sick kids, or really energetic healthy ones, into the mix and life can really start to get on top of you! But there are some simple things you can do to make life a little easier to bear and also let you try and recuperate. 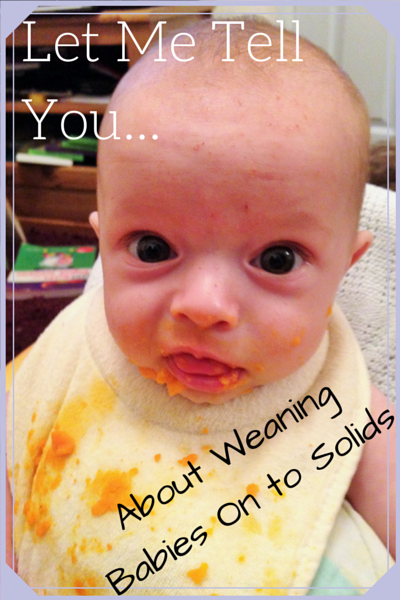 Having weaned five babies on to solids now I thought I would share some of the things I have learnt over the years. 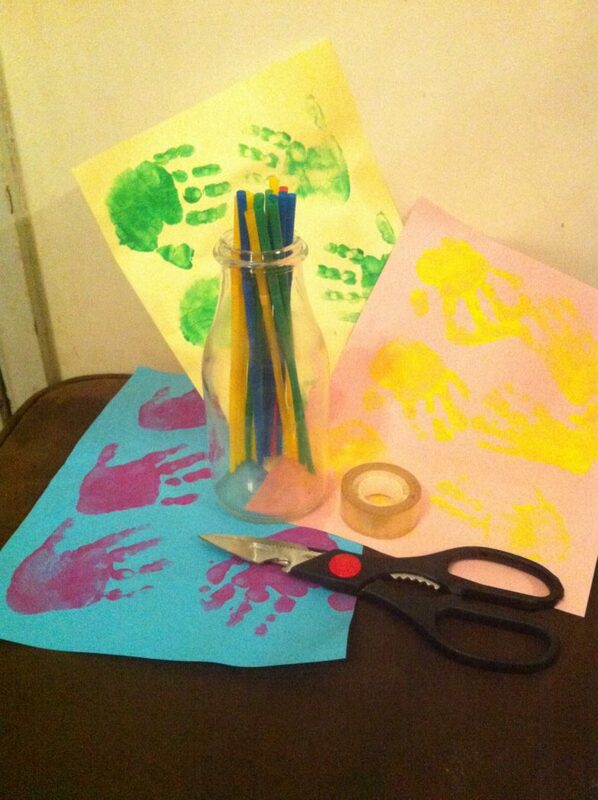 Hopefully they will help you if you are about to venture into this messy exciting part of your baby’s development! I have the biggest cookery book in the world, it’s called the internet! 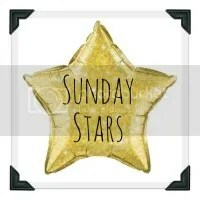 I love trawling through foody blogs and recipe websites looking for something new, delicious (and usually naughty!) to cook. I have a gas oven and one of the biggest problems I come up against when I find recipes is that many only tell you the cooking temperature in degrees Centigrade and/or Fahrenheit. Rarely will you see a gas mark in sight! This means searching for a chart to help with converting oven temperatures each and every time. I have created this chart as an easy reference that you can link back to,to help you with converting oven temperatures. You can bookmark this page, or print it out by either clicking here or straight on the image. I hope this free printable chart is useful to you. 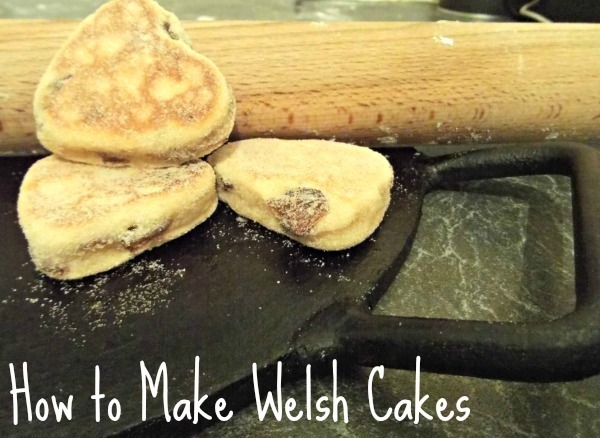 Last week I promised to share with you my welsh cake recipe. If you are unfamiliar with these little circles of deliciousness let me explain them to you first. 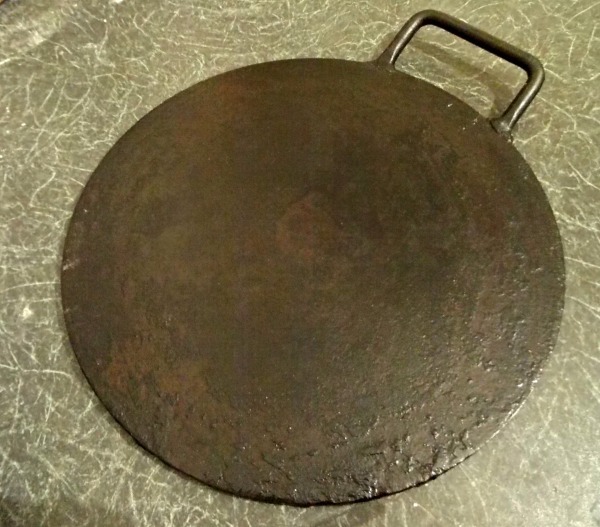 Although called cakes they are not baked in an oven, they are traditionally cooked on a bakestone (a thick, round piece of cast iron with a handle) although you can also use a heavy bottomed frying pan or a flat griddle. I have even heard of people cooking them on the flat part of a George Foreman grill! I do have to admit that my bake stone, isn’t really MY bake stone. It actually belongs to my mother and is probably well over 100 years old, but in a way I guess we are carrying on an age old tradition where there would be a ‘Family Bakestone’ that would be shared between houses as they were so expensive to buy! Most commonly known as Welsh Cakes they also have a few other names depending on what part of Wales you come from, among them are; pice ar y maen, bakestones (you can see where they got this name from!) and teisen radell. 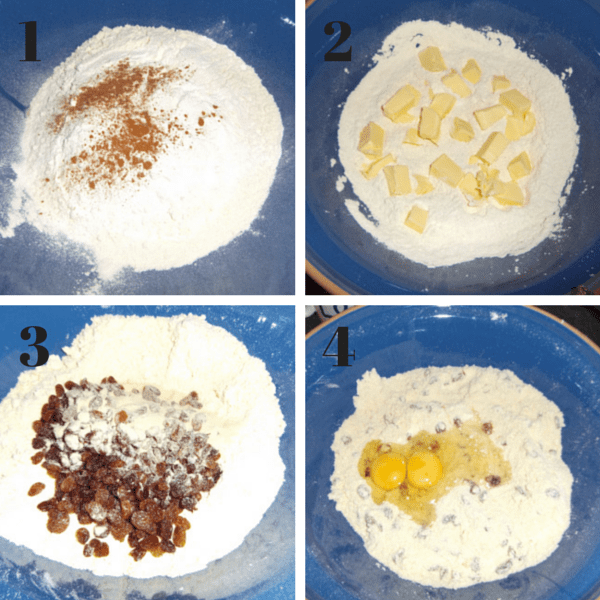 Originally the dough would have simply been made of just flour, eggs, sugar, butter or lard and raisins but over the years other ingredients, like spices, have been added. I expect every Welsh family would have had (and still do have) their own variation of this recipe. But at the heart they are all basically still the same little treat that is just the right size and durability for popping into a coal miner, or school child’s, pocket as a lunch time treat, or for afternoon tea with friends. Before you begin turn the heat on under your bake stone (or what ever you are using) to a medium heat. Keep in mind that you will turn this to low before you start cooking. 1. In a large mixing bowl add the flour, spices (if using) and baking powder. Stir together. 2. Roughly chop butter into cubes, add to the mix and rub together with the tips of your fingers and thumbs until they resemble breadcrumbs. 3. Add the raisins and sugars then stir together. 4. Add the eggs. Give them a quick chop with a knife, or your finger, to break the yolk, then using your hands incorporate everything together until you get a dough resembling pastry. You want it to be a soft but not sticky dough so add a teaspoon of milk, or a sprinkle of flour at a time if needed. 5. When your dough is the right consistency tip it out onto a floured surface and roll out to about 1cm thick, you don’t want it too thin or the Welsh cakes will cook too fast and become dry. 6. 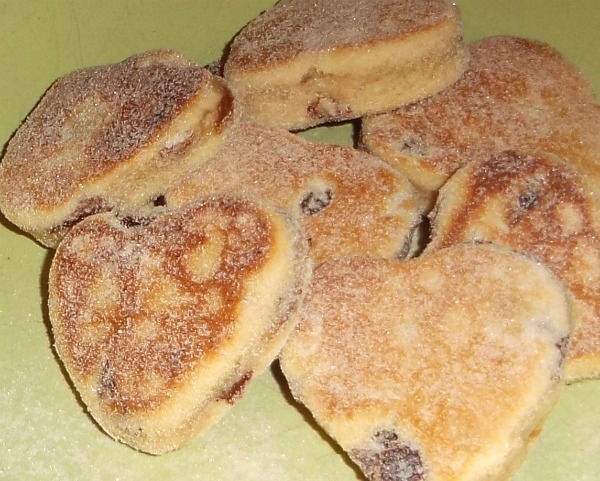 Although traditionally round I like to make shapes out of my Welsh cakes, especially hearts, this batch is destined for our mothers for Mother’s Day so hearts seemed to be a perfect fit. 7. place them on your bake stone. I tend to do smaller batches because they are really easy to overcook and there is a chance some will burn while you are flipping the first ones if you do too many at once. 8. I use an icing spatula to flip mine but use what ever you have at hand a fish slice, a fork even! You want to flip them when they are golden, not quite at the brown stage. When cooked your welsh cakes will be golden on each side but still squishy in the middle. My tip for a moist and fluffy Welsh cake is to wrap them in a tea towel while the are cooling. I place mine on a cooling rack so the steam moves around but doesn’t make the ones on the bottom soggy. When cool I dip each side into a bowl of caster sugar, you can just sprinkle liberally if you prefer. Half the recipe if you don’t want so many but be warned they don’t last long! It might take a bit of playing to get the right temperature under your bake stone. Don’t be disheartened if your first batch is dark on the outside and practically raw on the inside. I have mine set on the lowest heat but all hobs are different. I actually prefer mine slightly undercooked and still moist in the middle. Don’t be afraid of undercooking but do keep an eye on them as they get overcooked VERY quickly. You can replace half the butter with lard if you want a shorter welsh cake, alternatively if you are vegan/dairy intolerant then use margarine. Use as much or as little spice as you like, I just add a teensy bit or none at all. 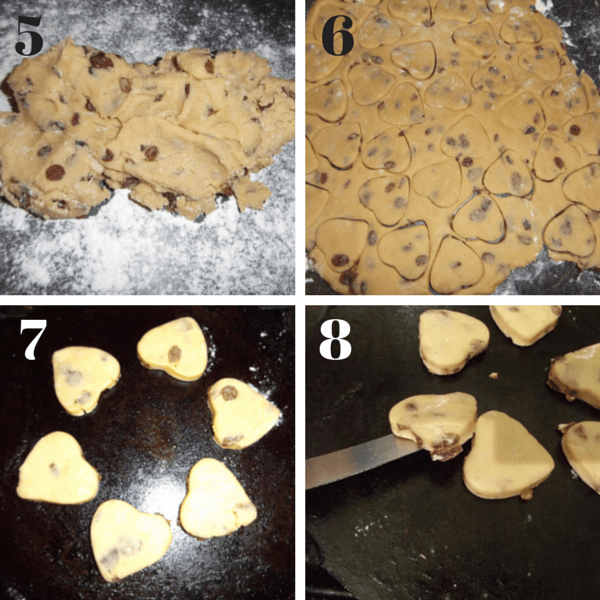 Use chocolate chips instead of the fruit, or just leave plain. Welsh cakes aren’t usually served with an accompaniment but taste divine (and extra naughty) spread with butter. You can also split them in half and make a jam sandwich with them. 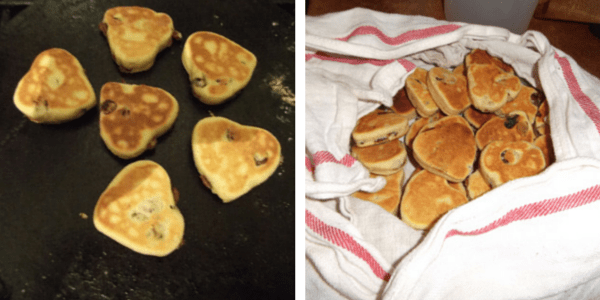 I do hope you try this Welsh cake recipe, they really are something everyone should try at least once. Please let me know if there is something you’d like me to explain more below. 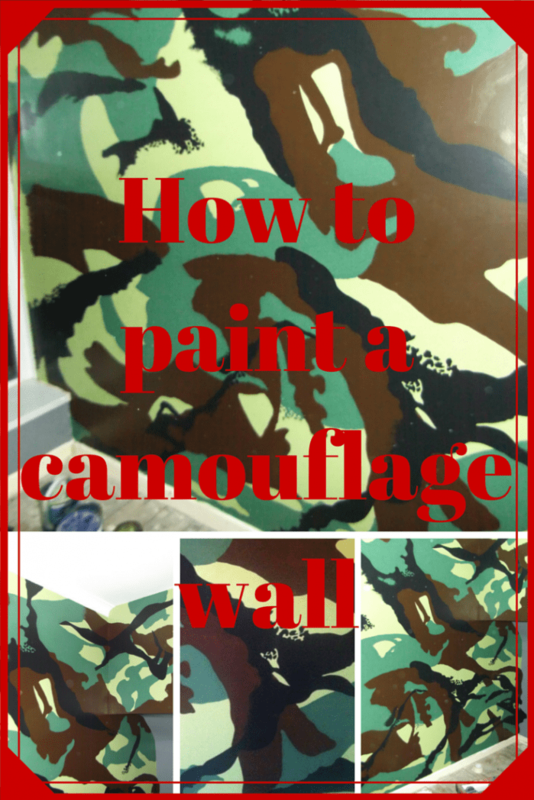 Painting a camouflage wall can seem quite intimidating but by following a few simple steps it can be done quite easily. 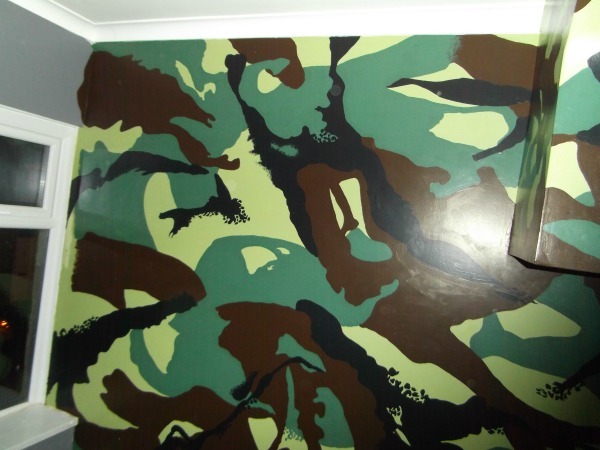 As you can see there are four colours, I was painting this camouflage wall for a military themed boys room so I stuck to ‘Army’ colours but there’s no reason to stick to this. When thinking about buying paint it will be easier if you choose one paler colour which will be your base coat, which you will need more of. 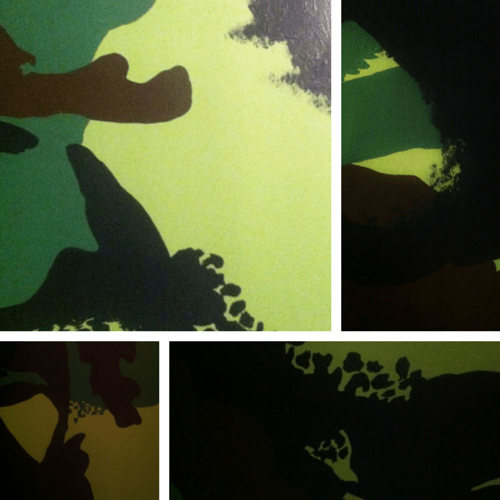 Then have at least three other, darker, colours. You will need around half the amount of each. Masking tape to create straight edges around woodwork and windows etc. Move all furniture away from the wall and protect any surfaces but avoid using the masking tape right until you need to. 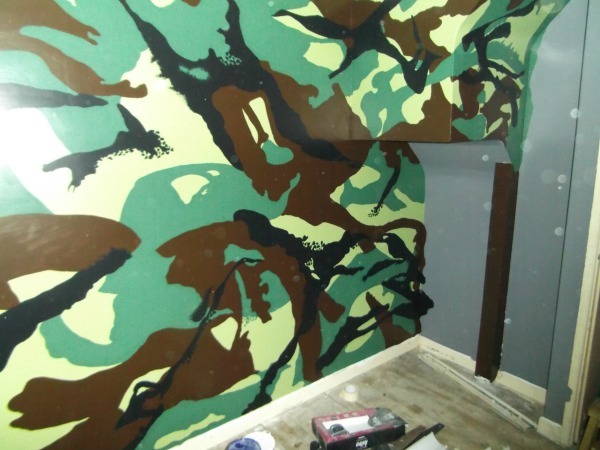 Mask off any edges then, using the roller, paint the base coat and use the 1.5 inch brush to do the cutting in. Remember this should be your palest colour. 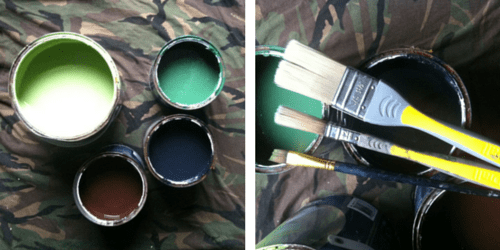 Unless you are using a ‘one coat’ paint you will need to follow the instructions on the tin as to how long to leave before your second coat. 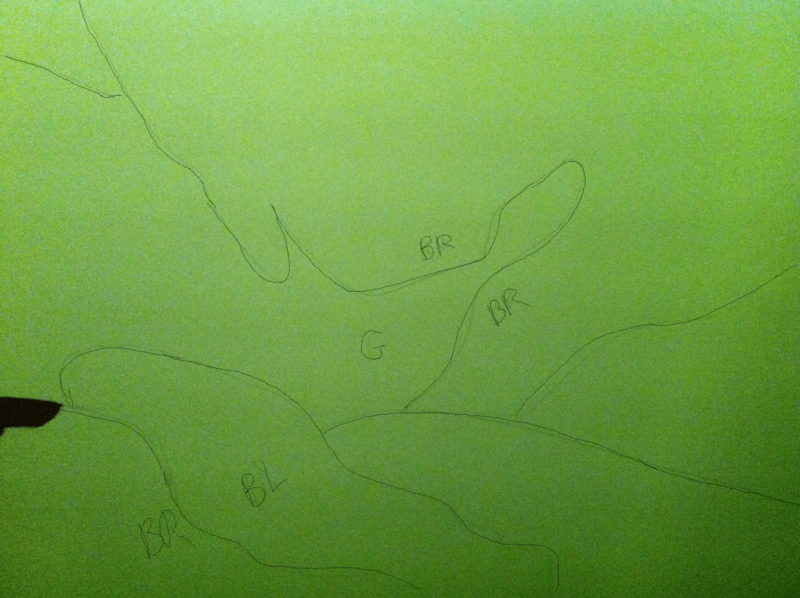 Using your pencil draw out your shapes, you will find it easier if you mark what colour goes where with the initials of each, remembering not to write where the base colour is as you won’t be painting this again. These lines don’t have to be perfect as you won’t see them under the paint. Using your brushes start painting your colours one at a time. You will find it easier to keep all your brushes close at hand. 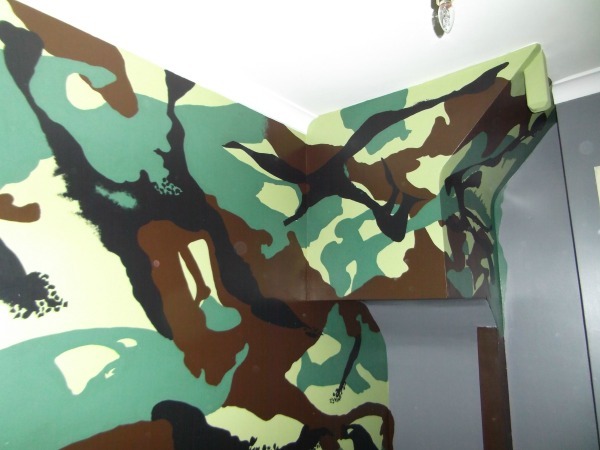 The fine paint brush will be ideal for the smaller areas. 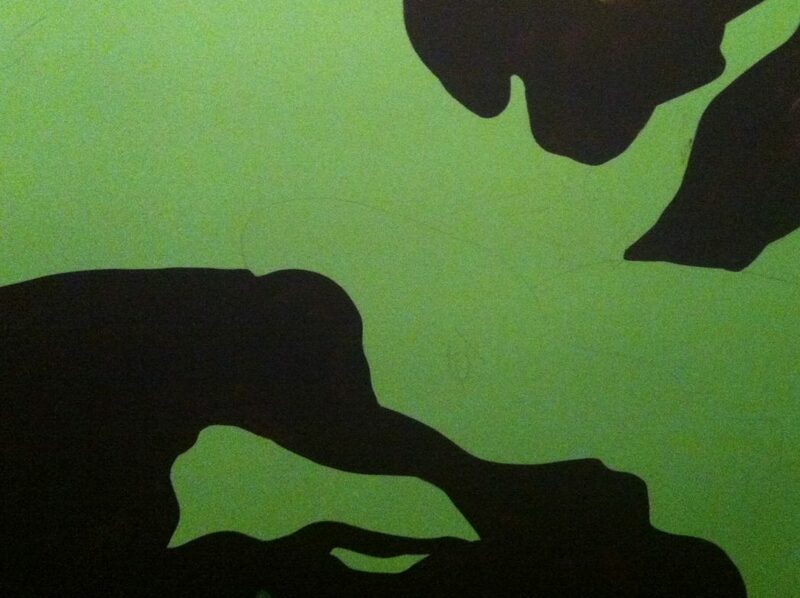 Don’t add any finer details yet, just do the basic shapes. 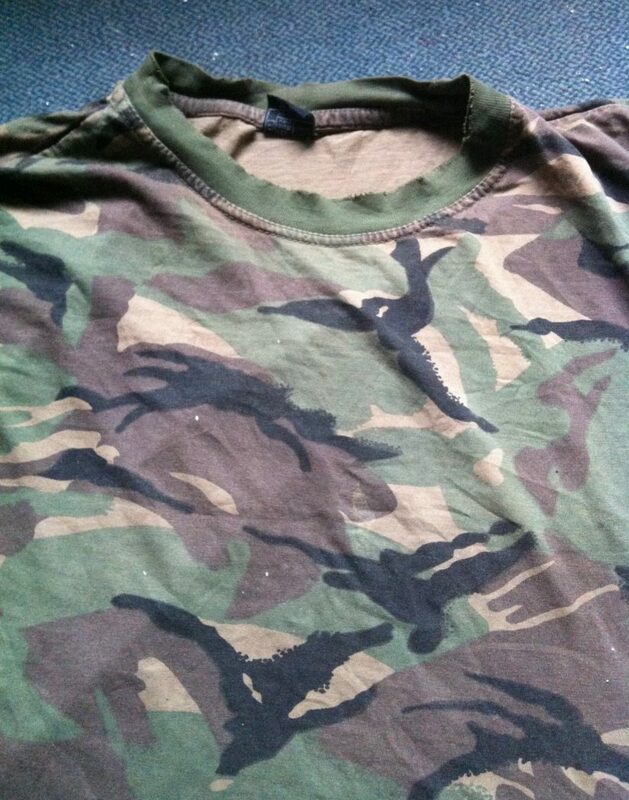 If needed add a second coat when dry. If the pattern you have chosen has some finer details, like mine does, wait until the very end to add these. 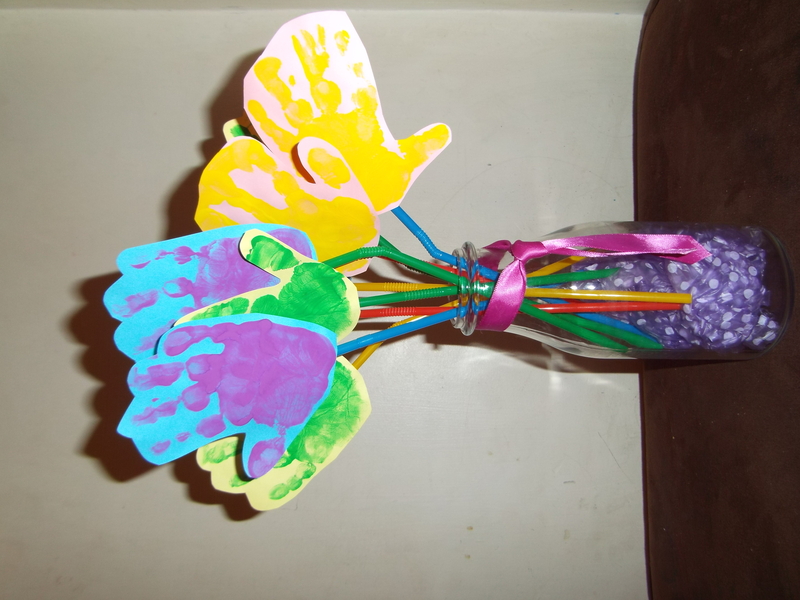 These Handprint flowers would make the perfect gift for Mother’s Day, birthdays or simply just to brighten up your day! The fact that they are so simple to make is just a bonus! 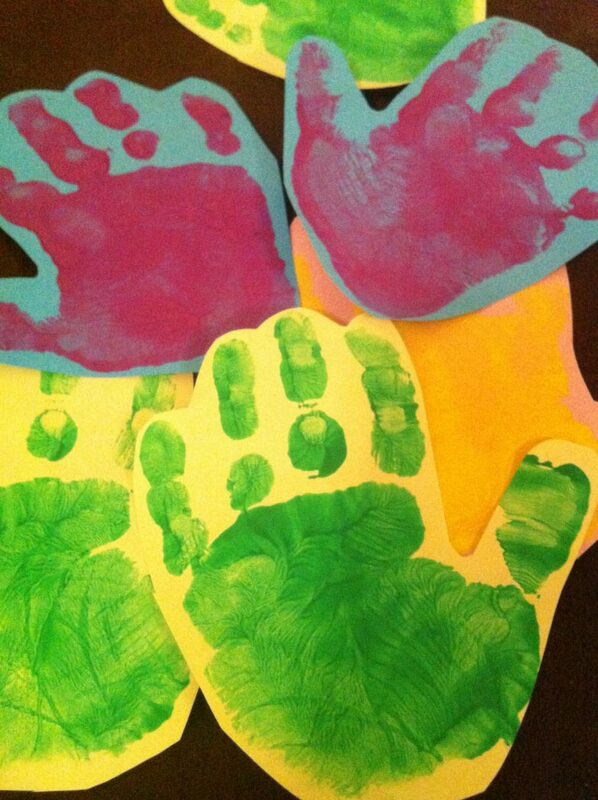 Take a willing small child and help them to paint their hands and make handprints. 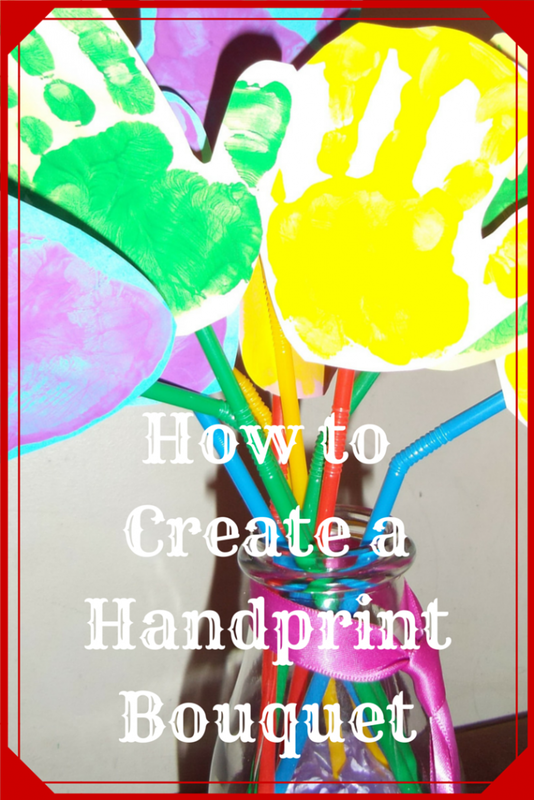 You can take a few approaches to this using a paintbrush to paint the hand, dip the hand into a big blob of paint or squirt a little paint straight into the hand and get them to squish it around. 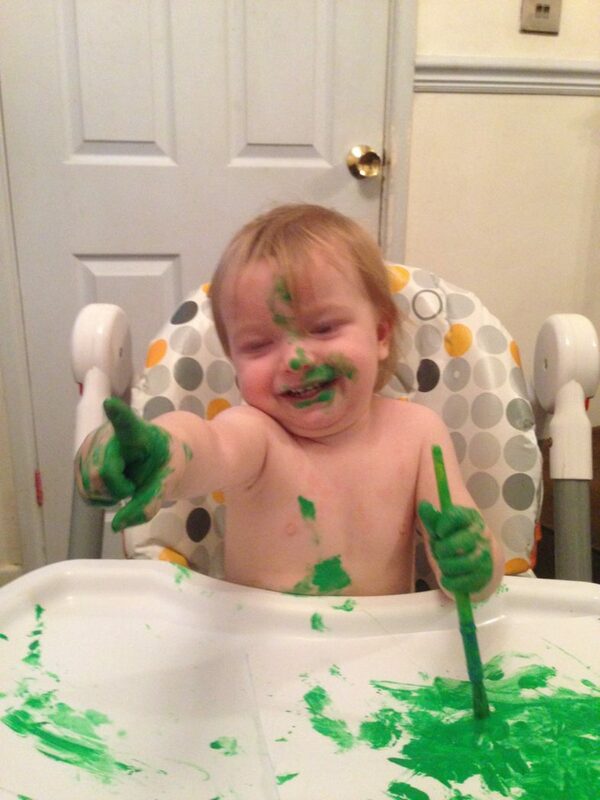 Once you have managed to get your child to cooperate for a few minutes and you have some nice handprints feel free to let them have some fun with the paint. 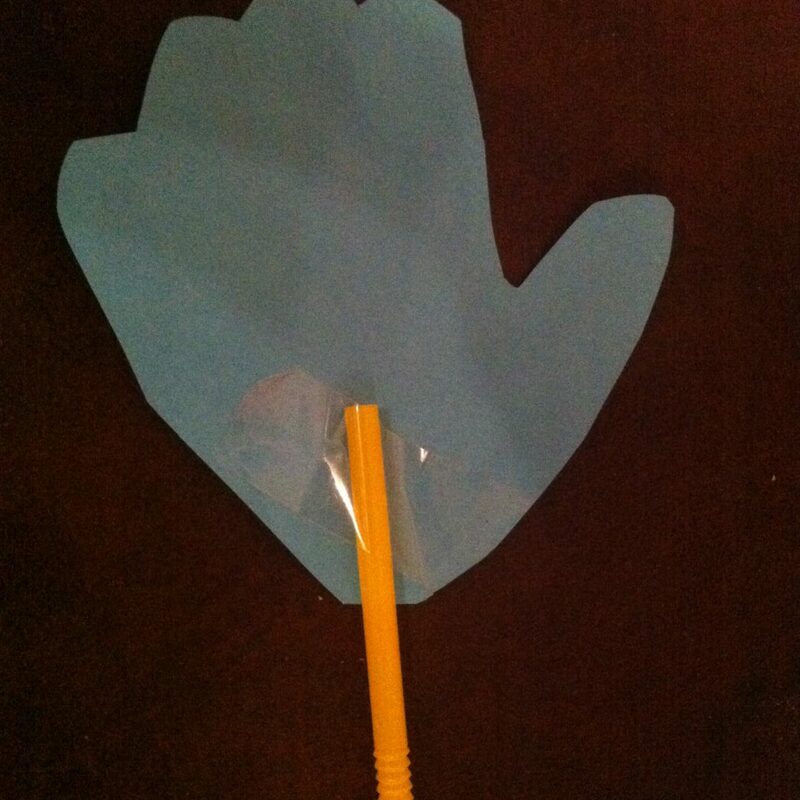 Cut out your handprints. To make them sturdy I don’t cut around each finger individually, I have some of these flowers that are over 12 years old and are still looking as good as new! But feel free to cut them out as you wish. Place your flowers into a pot or vase and enjoy! I got this small vase in Ikea for something silly like £1. I love the fact that it looks like a milk bottle! It’s a little too tall for the drinking straws so I pushed some spotty plastic inside to give them something to sit on. You could just as easily use pebbles or tissue paper. I then added this little ribbon to pretty it up even more. 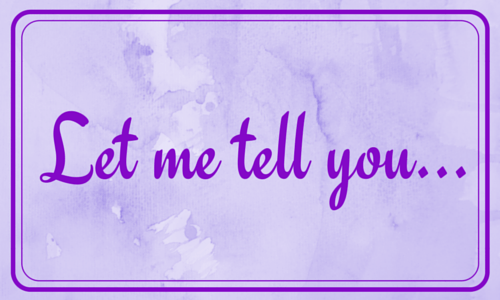 I have always been one of those people who needs to know. Doesn’t matter what it is, if a question pops into my head or I find myself unable to complete a task I will immediately set about trawling the internet to find the solution. I literally cannot sleep if there is something I need to know the answer to. Thank goodness for smartphones at 2am and I wake up wondering what I can do with left over candy canes! Before the internet, I would spend hours in the library, searching through our books and encyclopedias at home, or asking endless questions. Needless to say I didn’t do much sleeping as a teenager because I had too many things on my mind and no immediate access to the knowledge that the internet has provided me. One thing that would have sent me absolutely crazy before I got my instant information machine (my iphone) is being told that Oxford University is older than the Aztecs…. Crazy right? There’s no way on earth that this is true. Right? The Aztec Empire as we know it began with the founding of the city of Tenochtitlán in 1325. By 1521 the Spanish, in alliance with the Tlaxcala, attacked the Aztecs and overthrew the city. Et voila, no more Aztecs. Teaching in Oxford has been recorded as early as 1096 with the University itself was founded by 1249 and obviously its still going strong to this very day. Shall I just say… Mind. Blown!?! Any who, where were we? Of course some of what I learn (usually the most important bit) will be forgotten and the next time I need to know this information I’ll have to go search out the information again unless I write it down. Usually just the act of writing things down and reading it back helps me to recall a lot of information. And so dear readers the idea for this series was born. We will all benefit from it, I get to remember all the information I need and I also get to share with all you lovely people! Now this series will cover many topics from parenting to cooking, blogging to crafts plus anything and everything in between!